My death is inevitable, but how I die is not. The evolution of life is inevitable, but what kind of life is not. However just as there are many ways to die, most deaths follow a pattern. And while the evolution of life is probably quite common in the universe, the variety of forms it takes may also follow a narrow pattern. This is a decidedly minority view. Most speculators about life in the universe think we are too small minded to accurately imagine the diversity life can or will take. My guess is that the narrow gates of life’s evolution do not restrict how often it happens as much as it restricts how often alternative foundations (like DNA) happen. There may be only a few basic ways to construct a self-evolved, extropic self-reproducing life form. Once you have that, then possibilities open up. And if that narrow channel of evolution is true for life, it might also be true of intelligence. There may be only a few viable ways in which to evolve a mind that can be self-aware. And it may even hold for technological achievements. Perhaps there are only a few ways for a mind to create a global network for the first time. I am a child of science fiction, so I have not come to these heretical notions easily. But I changed my mind looking at our results so fare. The more we investigate the conditions for life — any life – to spontenously organize itself, the more remarkably narrow those conditions appear. Life requires a goldilocks’ touch – not too hot not too cold; not too ordered, not too chaotic; not too strong, not too weak. Up and down the scale of reality, from cosmic constants like force of gravity, to the exact size of our planet, to the temperature that ice molecules melt – all these values and hundreds more turn out to hover around sweet spots that permit the dynamic balance of life as we know it to thrive. In fact the dynamic balance of life, persistently hovering between order and disorder requires sweet spots. Outside of this very thin corridor of parameters, life-as-we-know-it is denied. The more science investigates extropic systems via models and simulations, the more sweet spots it discovers life depends on. When all these alignments are exposed and listed, the confinement of life becomes quite clear. For a short while, science thought the conditions required for the evolutoin of life were broadly bracketed – that is until we actually tried to duplicate them. The theory of life’s origins is easy to state: that inorganic chemicals self-assemble into living organisms with complicated biological chemicals. The problem is that so far we have been unable to recreate the path of that chemical transformation. The problem is not the long periods of time we figure this would need. The problem is the need for accumulation of small successes during these immense stretches of time. Our current theory is that elementary molecules of pre-life are confined by physical constraints (such as tiny pools, deep crevices, rock pores) and then activated by energy gradients (radiation, light, heat, sparks) into particular new arrangements. The initial results have to be protected from degrading by their confinement until a series of stepwise improvements can be accumulated. But in every pathway we can come up, starting from raw chemicals and ending at DNA, the intermediate steps and intermediate molecules are many and fragile. Every experiment to re-create those early molecular pathways has resulted in deadends far short of the total journey. Take the building blocks of self-replication: amino acids. As far as we can tell the self-assembly of these from primordial elements requires separate and contradictory conditions. One requires cool, non-alkaline water, one requires hot acid, one requires methane under pressure. Furthermore these ingredients are short lived and must be combined with each other in a matter of hours before they dissapate. It’s hard to imagine the curious world where all these specific environments converge simultaneously. The genius of biological evolution is that it dosen’t have to wait for lucky alignments of good fortune in order to make totally new things. It can aggregate small boring improvements overtime into something revolutionary. The conundrum of pre-life is that there are no self-sustaining organisms to accumulate small advantages within. In other words, pre-life does not have all the evolutionary advantages of life. Pre-evolution, so to speak, has different rules. Before the genesis of life, little complexity can accumulate; there are no membranes to maintain and protect it. Therefore in the abiotic environment everything new has to happen all at once. Dozens or perhaps hundreds of delicate chemicals and catalysts, each born from a different physical regime, must be brought together to construct the first self-replicating DNA molecule. There might be easier routes we have not thought of. It’s possible that self-replication and even metabolism were first formed in a mechanical way, layered on top of pyrite crystals or clay particles, so that self-replication may have not been organic at first, but a process patterned on more stable minerals. This crystalline possibility has inspired science fiction authors and bold scientists to speculate about alternative modes of life entirely. Surely somewhere in the universe, they suggest, life might embody silicon rather than carbon, or dry not wet, or gaseous not solid. Fred Hoyle imagined black clouds of interseller dust sparking order out of nothing. Gas becomes a diffused distributed life-like spirit. Silicon-based organisms, which could in theory parallel a lot of carbon-based tissue, is a science fiction regular. In theory there could be dry life somewhere in the universe, but when we attempt to lay out a viable pathway from inert material to self-assembling life in these alternative matrixes, billions of years and all the space in the universe don’t seem to help in imagining the intermediate self-organizing steps that are needed. The point of highlighting these difficulties is not to suggest that a miracle is needed to explain life’s appearance, or to imply that some other alien power is required, but to point out that the trajectgory which life has taken on earth – an aqueous bath packed wiht DNA – may be the primary, or possibly the only way to life. The route to life is lonely, transversing a possibility space so sparce, that it seems as if the only possibility in that space is the path that life as we know it took. The more alternatives we explore in trying to pinpoint the historical path to DNA, the more apparent it is that DNA is a very special case. Unlike the world of beattles, say, or mites, where each beattle or mite is surrounded by a thick forest of alternative possible organisms, DNA stands alone. Simon Conway Morris, whose work on the Burgess Shale inspired various theories of life’s diversity, calls DNA “the weirdest moleculte in the universe” and it is. A surprisingly simple arrangement of a few atoms supports itself in a fabulous handy architecture that can unzip and zip at a touch, and spin off a never repeating cascade of copies. Its beauty is almost mathematical. The ability of this molecule to maintain order, and yet dissolve at command, to spin off innovation, yet retain accuracy is what gives life its power. So far we have unable to discover or invent remotely anything like it. DNA may be unique as the number pi. According to this theory, we should expect most of the life we encounter in the galaxies to be based on DNA-ish amino acid molecules. If that much is probable, then it is also probable that complex organisms will have bi-lateral symmetry, neurons, tubular guts, and eyeballs, since these occur over and over again in many diverse families of earthy life based on DNA. If we could study enough living planets, we’d come to recognize many earthly traits as universal. Not that every organism in the univese must have them (most organisms on earth don’t); only that these characteristics will commonly appear wherever life appears for long. Morris has said, “If you want to study exobiolgy, study DNA.” In this way the conceit of most science fiction movies – that the aliens are not so alien – may turn out to be true. Just to be clear, the conditions for the intial evolution of life are vastly more restrictive than for the growth of life aftwards. We can easily imagine life thriving in places it might not evolve in. It is not hard to imagine life conquering extremely harsh environments, like space or gas clouds, or even overtaking silicon or other alien methods, if it has the benefit of evolutionary incremental accumulative change. 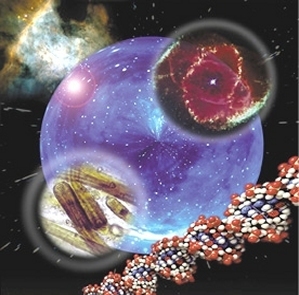 A living molecular system may evolve for the first time in some very condusive crucible in a galaxy and then seed itself on other planets where it could not start itself. Once started elsewhere it may thrive till it seems impossible it was not always there. Some cosmologists like Fed Hoyle believe that DNA itself may be such a candidate; that life as we know it originated off the earth, but once deposited on the perfect blank petri dish of this planet it blossomed and swelled in continuous self-amplification until it became totally native. There may indeed be other molecules in the universe capable of such autonomous self-replicating feats as life demands, but they may not be able to spontenously self-organize the first time. These alternative life-foundations may require a mind to invent them; that is they may require an elaborate series of chemical steps beyond themselves to get started – in a test tube somewhere. If you like science ficton, one scenario posits that DNA itself is an invented molecule. Devised by some alien mind, and seeded either deliberately or inadvetently on this planet. The reason we have had so much trouble charting out DNA’s spontenous origins on earth is that it has no spontenous origins at all. With a sample size of one (one life, one intelligence) we don’t know whether the forms we see are exceptional or universal. We tend to view ourselves as exceptional. The view of life propounded by evolutionist Stephen Jay Gould in his essays over and over again, was that if we rewind the tape of life, we would get nothing like life as we know it. There are no biases, no channels, no gates, nothing but random routes that will never happen again. Our peculiar forms are exceptional in the sense of being unrepeatable. The alternative minority view is that unrepeatability of variety is true in the short term, but that at the large metascale, at the scale of billions of years, the constraints of physics dictate certain possibilities. Chemistry may decide how many ways molecules can spontenously self-organize into life. Chemstry may decide how many ways those molecutles can coordinate themselves into higher forms. And those initial conditions may in turn limit the number of ways they can sponetenously arrange themsevles into a mind. And given all that, this molecular-based brain may be limited in the kinds of thoughts it can reach, and the kinds of technology it can produce. And thus in a certain real way, the path that this mind’s technology takes may be far more restricted that it appears to those minds. If so, so what? Well, we should continue to pay attention to the evidence (or not) of how life spontneously arose. Efforts by Craig Venter and others into creating synthetic life are most promising in this regard. Secondly, we should be aware that technological development may be constrained. Just as there may be very simple life forms that can only arise via a mind, there may be very simple technological forms that can only be reached via the circuitous route of very advanced technology. Futhermore despite our strong belief that technology is entirely governed by human free will, future steps in technological development may be writ more by the foundations of physics and chemistry than our whimsy. In this interesting essay, you seem to me to say that our best efforts has not turned up any vastly different ways for life to evolve. But at the same time, you acknowledge that modern science has not yet been able to map out, from start to finish, the origin of terrestrial life. This latter problem has more funding and you’d think it was the easier of the two, since it has plenty of living specimens and some fossils to go by. I suggest that we acribe the word “govern” to those cases where a choice is made. We can use “cause” for those cases where things are “writ by the foundations of physics and chemistry”. Our choices may at times be whimsy, but often they are profoundly important to all other creatures. Our frequent failure to make good choices seems to be very much related to whether we choose to listen to and obey the one who gave us choice when he created us in his image. I always get the sense that you, Sir, are a mind stretching at the bounds of material knowledge, pushing back the limits. Thank you for such clarity in laying out the problem and sharing it with us. Don’t mean to be presumptuous but the topic of creation of life is sort of covered in Tantra and other branches of eastern mysticism. Perhaps not with the same tools or terminology as western science but nevertheless with equal rigor in a different system of knowledge. It is not necessary to create silicon life in a tidal pool. Doing it in a computer science laboratory is adequate. I think that we are well on the way to doing it. If we can do it, then it is a safe bet that others already have. Who can doubt that we will at some point create self-replicating silicon based intelligences, for deep space exploration if nothing else. Once created, they will have “a life of their own,” so I would expect to find them as possible contacts in the universe. To summarise in relation to the idea that DNA is the only likely path to life, my assumption is that if all other alternatives to DNA are extremely unlikely, then quite possibly DNA is also extremely unlikely, and the reason we observe our own existence as a DNA-based life-form is because it is the least extremely unlikely possibility. To put it another way, to get life, we do need a “miracle” (which luckily we can get for free from a multiversity assumption), and DNA is the “least” miracle, and therefore the only one that is ever going to be observed. @Philip: Man, that is pretty rad. I get the logic of why DNA is the least miracle (nice concept); as far as how that plays into multiveristy, I am not as sure what I think, since I am not confident of my understanding of how each variety of universe relates to another, if at all, and how one “survives” or propagates, etc. Need to read some more… Thanks. How do you feel about this experiment?